Are Autonomous Trucks Inevitable for Freight Distribution? In discussing the pressing truck driver shortage in a recent blog, we briefly mentioned the prospect of autonomous trucks as a longer term solution to the problem. Many are skeptical about this vision of the future, and there are certainly wildly differing opinions, even among the faithful, about when, exactly, driverless trucks will be on the roads in sufficient numbers to make a difference – ranging from 2020 to 2050. It is very possible that we will see enough of these trucks on the road to make a difference within the next 10 years with respect to freight distribution, but we also feel there are important questions to ask about exactly how they will function. The chief concern, of course, is safety. In 2012, over 330,000 large trucks were involved in crashes that killed about 4,000 people in the United States. Close to 90% of those were caused by driver error. But what is the opportunity for computer error in an autonomous truck? There has been understandable concern about the May 7, 2016 fatal crash of a Tesla autonomous car, which failed to brake when an 18-wheeler turned across its path. An article in Scientific American raises important questions about the gaps in what we expect from self-driving cars and what they’re capable of. It quotes Amnon Shashua, co-founder of Mobileye, which provides the crucial artificial vision technology in Tesla’s autonomous cars. “It’s not enough to tell the driver you need to be alert,” Shashua said. “You need to tell the driver why you need to be alert.” He provided no details on how that should be done, however. What is an autonomous truck, exactly? According to The Guardian, mining giant Rio Tinto already uses 45 240-ton driverless trucks to move iron ore in two Australian mines, saying it is cheaper and safer than using human drivers. However, this operation is far from the busy public highway, so safety considerations are a minor issue. We’re a long way from autonomous trucks for freight distribution. A good case in point is Daimler’s Freightliner Inspiration Truck, which has already been officially licensed to operate on the public highways of Nevada; the first of its kind to be approved. “The driver is a key part of a collaborative vehicle system," said Richard Howard, Senior Vice President, Sales & Marketing, Daimler Trucks North America. "With the Freightliner Inspiration Truck, drivers can optimize their time on the road, while also handling other important logistical tasks, from scheduling to routing. The autonomous vehicle technology not only contributes to improved safety and efficiency, but allows for improved communication through connectivity and integration." The return of the truck convoy? Daimler is also working on another idea for reducing, but not eliminating, the need for truck drivers, alongside Peloton Technology, a California-based technology company. Together, they are working on creating truck “pelotons” -- caravans of autonomous trucks headed by a lead truck with one driver in the cab who would lead the caravan of a dozen or so trucks along the highway. Peloton’s platooning technology connects two or more trucks via cloud technology and uses safety features like active braking, which is already found on many passenger cars today. Similar technology was used in a successful cross-border trial in Europe in April, when more than a dozen self-driving trucks made by DAF, Daimler, Iveco, MAN, Scania, and Volvo – some of Europe’s largest manufacturers -- arrived in Rotterdam after a trip that took the trucks from Sweden, Germany, and other locations. One proposed advantage of truck platooning is that you would have trucks driving at a consistent speed, which would help traffic flow on heavily congested roads in Europe. It’s crucial to remember that these operations still require a driver physically present in at least one truck. However, there’s a further catch. Daimler says the lead truck driver of a peloton would control all the trucks, but drivers (note the plural) will still be needed to maneuver the highway exits, city streets, and backing up to the loading dock. 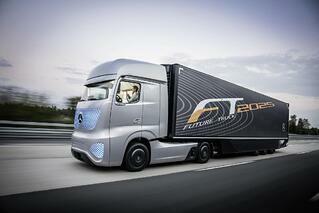 Would autonomous trucks really be driverless? The Freightliner Inspiration Truck, for example, operates on highways at what the National Highway Traffic Safety Administration defines as Level 3 of autonomous vehicle capabilities. That means the driver can give over complete control of all safety-critical functions under “certain traffic or environmental conditions.” The autonomous truck system will keep the truck at the right speed, in the right lane, at a safe distance from other vehicles, etc., and will alert the driver when changes in conditions require his intervention. Further, the driver is supposed to be in control of the truck for exiting the highway, on local roads and in docking for making deliveries. But, if that means a driver has to be in the truck at all times, then it doesn’t much help the driver shortage problem as it’s related to freight distribution. Indeed, it puts one very bored guy (or gal) in a very expensive piece of equipment. How quickly is a driver supposed to intervene when conditions change? What if the driver is asleep? Will drivers in “non-intervention” mode be clocking Hours of Service (which are well on the way to being monitored without margin for error by mandatory, in-cab, wireless systems)? Or is there a scenario in which truck drivers will wait in clusters at highway exits or near distribution centers to perform similar tasks to ocean shipping pilots, who do the delicate work of guiding ships into port after their journeys across oceans? With great minds such as ex-Google executives Anthony Levandowski and Lior Ron working on Ottomotto, driverless technology for long-haul trucks, it seems clear autonomous trucks will play a role in future freight distribution. But what they’ll look like, how they’ll operate, and – crucially – what they will mean to the truck driving community, remains to be seen.